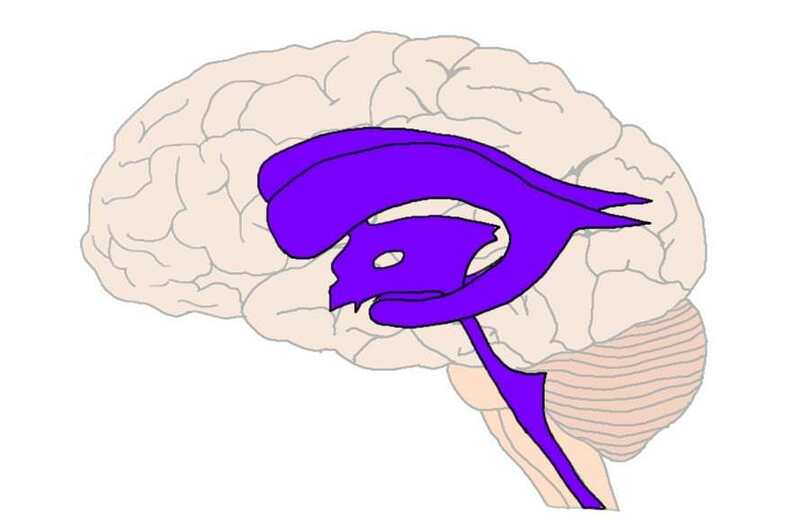 The ventricles are four interconnected cavities distributed throughout the brain that produce and contain cerebrospinal fluid (CSF). The two lateral ventricles are C-shaped chambers found in the cerebral hemispheres (one in each hemisphere). They are connected to the third ventricle by an opening called the interventricular foramen. The third ventricle is a very narrow cavity that runs along the midline of the diencephalon; it communicates with the fourth ventricle via the cerebral aqueduct. The fourth ventricle is wedged between the cerebellum on one side and the brainstem on the other; it extends to, and is continuous with, the central canal of the spinal cord. What are the ventricles and what do they do? When looking at the interior of the brain, the four hollow ventricular cavities stand out in contrast to the rest of the organ, which is mostly composed of convoluted grey matter. Their distinct appearance was likely part of the reason extraordinary roles were attributed to the ventricles in early conceptualizations of brain function. In ancient times they were thought to house the "animal spirit," a mysterious substance that allowed the immaterial soul to be able to exert control over the physical body. Eventually support for this tenuous hypothesis dwindled as mystical thinking about the brain fell out of favor. Even according to the more rational perspectives on brain function that took the place of early mysticism, however, the ventricles were credited with important--yet vague--functions like the generation of imagination and memory. It wasn't until 1764 that it was discovered that the ventricles were filled with CSF (not animal spirits) and that the connections between them allowed CSF a route to flow throughout the brain. The production and circulation of CSF would eventually come to be recognized as the main role of the ventricles. The ventricles are lined with a specialized membrane called the choroid plexus, which is made up of ependymal cells. Ependymal cells are glial cells tailored to produce CSF, and they secrete the fluid into the ventricles at a relatively constant rate; about a half a liter of CSF is produced by ependymal cells every day. CSF passes through the ventricular system and circulates around the brain and spinal cord in a small area between the meninges called the subarachnoid space. CSF is thought to play many important roles in the brain. It makes the brain buoyant, reducing the physical stress it would otherwise experience from the forces of gravity and movement. In fact, without being suspended in fluid of some sort, the brain becomes distorted under its own weight and the delicate tissue can tear. The layer of CSF surrounding the brain also acts as a buffer against potential injuries that can be caused by mechanical pressure or force (e.g. being hit hard in the head). Additionally, as the CSF circulates over the brain it carries away toxins and other waste matter and empties these into the bloodstream where they can eventually be removed by mechanisms like kidney filtration. The rate of CSF production in the ventricles is fairly constant regardless of changes in pressure within the ventricles (i.e. interventricular pressure). This can be problematic if the passage of CSF is blocked somewhere within the ventricular system. CSF will continue to be produced, but it will have no means of exiting the system. This will cause pressure within the ventricles to increase, and the rising pressure may eventually force the ventricles to expand. The expanding ventricles can then impinge upon other brain structures, causing a variety of complications (depending on where the blockage is and which structures are most affected). When this occurs in children whose skull has not completely ossified (generally under age 2), it can cause the head itself to enlarge. This condition characterized by excess CSF production and ventricular enlargement is known as hydrocephalus (commonly called "water on the brain"). There can be a number of different causes of a blockage that leads to hydrocephalus, such as a tumor, infection, or congenital malformation. Hydrocephalus can often be treated by surgically implanting a shunt that drains the ventricles of excess CSF and empties it into the abdominal cavity. This approach can be successful, but if the reason for the blockage isn't resolved additional surgeries may be required in the future (e.g. to replace an outgrown shunt, treat an infected shunt, etc. ).